Sprinting down the hash marks into the back of the end zone, Jason McCourty’s incredible play to knock a possibly game-changing touchdown out of the hands of Brandin Cooks is only one of many defensive efforts that won Super Bowl LIII 13-3 for the New England Patriots. Brian Flores’ New England defense held the Los Angeles Rams to 301 total yards, 229 of which were passing. Kyle Van Noy ultimately made the biggest impact on defense due to the constant pressure he kept on Jared Goff. 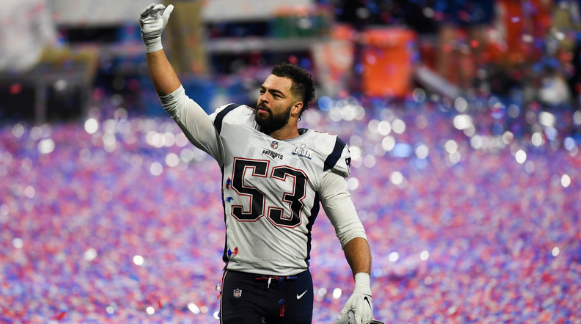 Lawrence Guy and Albert McClellan came up big, as well, knocking Goff down during throws, and Jonathan Jones, Duron Harmon, and Dont’a Hightower made some important hits, as well, but Van Noy was an absolute beast on the New England defensive line. On an important third down midway through the second quarter, Van Noy made the one of the best plays of the entire game sacking Goff for a huge 14-yard loss. The linebacker Van Noy started the play in the defensive backfield, teaming up with Hightower to erase any thought of passing to running back Todd Gurley up the middle of the field on a quick pass, but once Goff left the pocket, Van Noy started towards the young quarterback. Once there were no blockers in site, Goff started to panic and looked for heave downfield, but he made the wise decision to hold onto the football. Van Noy soared over the acreage between the 50 and the Rams’ 40-yard lines. Diving, he spun Goff around and grappled him to his knees on Goff’s own 39-yard line, to force Los Angeles to punt and give New England the football. Van Noy, Jones, and Hightower combined to sack Goff four times, Hightower taking him down twice. Stephon Gilmore’s game-winning fourth quarter interception was forced by pressure and an almost-sack by Duron Harmon. The Patriots threw a zone blitz at the Los Angeles offense who put four receivers running downfield in various crossing routes, with Cooks running a straight route right directly to the corner of the end zone. With six blockers left to defend their quarterback, Goff, there was one man left unblocked in the Patriots defense, who were rushing seven. That unblocked man was the safety Harmon who forced Goff to drop back about two more yards and move slightly to his right. The scared quarterback had to toss the deep pass to Cooks off of his back foot to avoid being sacked for a major loss by Harmon. Harmon’s aggressiveness and Goff’s nervousness translated into a short lob of a throw. With the cornerback Gilmore guarding the wide receiver Cooks closely, trailing him by only a couple of steps, cutting off Goff’s underthrown toss was the equivalent of shooting fish in a barrel. Leaping about two feet into the air and finally landing on the three yard-line, Gilmore came down with the ball, and the game, thanks, in large part, to Harmon’s speed and pressure on the quarterback. Punter Ryan Allen gave the New England defense a great deal of help with his strong leg. He finished the night punting for 215 punting yards on five attempts. Matthew Slater was a huge help on the punts, fielding the ball on multiple occasions inside the five yard-line to ensure that the Rams would have a rough starting point. Julian Edelman and Sony Michel provided a lot of help for the defense, Edelman receiving for 141 yards, rushing for eight, and Michel rushing for 94 yards and one touchdown. Tom Brady, though he did not play his best game, passed for 262 yards during the game. Stephen Gostkowski also hit two of three field goals. While these numbers did not exactly make the defense’s job the easiest it could have been, points are good for everyone and provided them with enough of a cushion to win.